If you’re traveling along US-87 between Great Falls and Havre, you’ll slow down to pass through several agricultural communities. Each has features that set it apart from the rest. For Big Sandy, one of those features is a large mural on the side of Pep’s Bar. 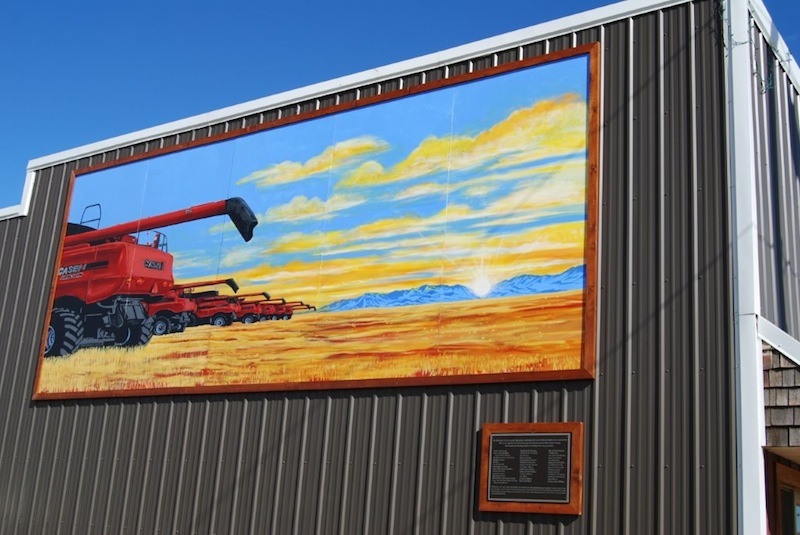 The 8’x20’ painting is visible from the highway and depicts a fleet of combines harvesting a field. Those curious enough to stop and admire the mural will notice a plaque underneath that tells the story behind the artwork. In 2014 Rusty Danreuther, a Big Sandy local, left his farm during harvest to seek melanoma treatment in Texas. Rusty was a pillar in the community, always volunteering to announce sports games, play music, and mentor children. He was beloved by many. Not wanting Rusty to lose the fruits of his labor, members of the community came together to harvest Rusty’s fields for him. The experience had a significant impact on Lisa Myers, a friend of the Danreuther family and a member of the Big Sandy Chamber. After Rusty lost his battle with cancer, Lisa conceived of a project to honor him and the community as a whole. With donations from Big Sandy citizens and businesses, the Big Sandy Chamber funded a mural to be built on the side of Pep’s Bar, which is run by Rusty’s son, Josh. Lisa coordinated with Josh and Rusty’s daughter, Kristin, who had taken photos of the combines harvesting the Danreuthers’ fields. The photos were sent to Lisa’s cousin, Annie VanEngelen, a professional mural artist in San Diego. Using them for inspiration, Annie painted five 4’x8’ panels with top-of-the-line materials that are resistant to Montana’s harsh weather. The panels were shipped to Big Sandy, assembled, and framed on the side of Pep’s Bar. For more information about Big Sandy, visit bigsandymontana.com.